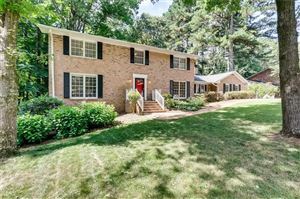 2456 Helmsdale Drive NE Atlanta, GA 30345 listed for sale by Sally English, Associate Broker, Realty Associates of Atlanta LLC. Call or text Sally English 404-229-2995 for easy showings. Sally English and The English Team specialize in homes and neighborhoods with convenient commutes to Emory University, The Centers for Disease Control (CDC), VA, CHOA, FEMA, FBI, Mercer University and Midtown Atlanta. Renovated, move-in ready 4 bdrm/3 bth home with lots of recent upgrades, incl. hardwoods throughout, marble, quartz, recessed lighting, stainless steel appliances; huge family room with built-ins and fireplace; main level bdrm & full bath perfect for multigenerational situations. Oversized detached garage; high end, zoned HVAC (2016); new exterior paint (2017); large master w/ walk-in closet; tons of storage; large lot on cul-de-sac; alarm system. Partially finished basement offers 2nd living space. High-scoring Henderson Mill Elem and Lakeside HS. Convenient commute to Emory, CDC, CHOA. Students at 2456 Helmsdale Dr NE Atlanta GA 30345 attend high-scoring Henderson Mill Elementary School, Henderson Middle School and Lakeside High School in the DeKalb County Public Schools System. Nearby charter, magnet, and private schools include Kittredge Magnet School, The Globe Academy, Coralwood School, IHM, Intown Community School, Cliff Valley School, Marist, St. Pius X and Paideia – all located within a reasonable commute. Henderson Mill Elementary School is the only STEM and STEAM certified elementary school in DeKalb County, and one of only four STEAM certified elementary schools in the state of Georgia. STEM CERTIFICATION in a nutshell – “high quality educational opportunities in science, technology, engineering, and mathematics (STEM) fields. STEM education is defined as an integrated curriculum (as opposed to science, technology, engineering, and mathematics taught in isolation) that is driven by problem solving, discovery, exploratory project/problem-based learning, and student-centered development of ideas and solutions.” STEAM CERTIFICATION incorporates the arts (visual, music, etc.) into the school’s STEM curriculum. The home is within easy car commute to Emory University, Centers for Disease Control (CDC), CHOA, the VA hospital, Mercer University, and FEMA without using any interstate highways. Close proximity to I-85 and I-285 provides homeowners with easy access to Atlanta neighborhoods and amenities in all directions – Oak Grove, Brookhaven, Chamblee, Decatur, Toco Hills, Dunwoody/Perimeter, Buckhead/Lenox, Midtown, Tucker, Stone Mountain, etc. DINING ROOM has a lovely chandelier and views of living room, kitchen, and backyard. LIVING ROOM has lots of light from 3 windows. FAMILY ROOM is oversized with lots of built-ins. KITCHEN features granite countertops and stainless steel appliances. Includes breakfast area with lots of natural light. Oven/Range upgraded in 2018; Microwave upgraded in 2015; Dishwasher upgraded in 2015; Disposal upgraded in 2015. GARAGE is very spacious and features a double door with remote controlled overhead door. Loads of storage space. Exterior garage lighting was upgraded in 2017. MAIN FLOOR BEDROOM features a double window, closet, ceiling fan and light. MAIN FLOOR FULL BATH. Fully remodeled in 2017 with carrera marble floor, subway tile, shaker style vanity, Tranquility quartz, Kohler fixtures and toilet, canned lighting, carrara niche and glass sliding doors. MASTER BEDROOM offers plenty of space to accommodate a king-sized bed as well as a dressing area. MASTER BATH includes ceramic tile floor. Walk-in shower with ceramic tile floor and walls plus frameless glass door. Stain finish vanity cabinet with granite countertop. Linen closet. MASTER CLOSET. Spacious walk-in closet with organization, great lighting and hardwoods. FRONT CORNER BEDROOM has a double window, closet, ceiling fan and light. REAR CORNER BEDROOM has two windows, a closet and a ceiling fan and light. UPSTAIRS BATHROOM features an upgraded vanity with quartz top, new toilet, and new faucet and showerhead (2017 upgrade). BASEMENT offers luxury vinyl planks and fresh paint and lighting (2017 upgrade). Great space for a second living space for kids. BACKYARD features a beautiful retaining wall, patio space, and firepit. Upgraded two bathroom cabinets to 36-inch height, quartz countertops and large sinks in 2017. From the South: I-85 North to Shallowford Rd. Right on Shallowford. Left on Briarcliff Rd. Left onto Briarcliff Way. Left on Henderson Mill Rd. Right on Midvale Rd. Right on Lauderdale Dr. Left on Helmsdale Dr. House on left as you enter cul-de-sac.